The PDQ pipe fit-up clamp is one of the most commonly used pipe alignment clamps on the market, and for good reason. This clamp is easy to use requiring no training, if treated properly it should last for years in the field, and at the low end on cost this pipe alignment clamp is very affordable. Whats not to like? 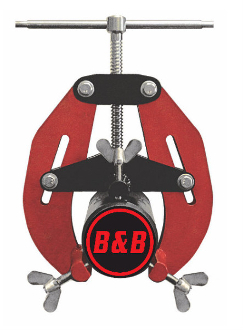 B&B offers this quality built alignment clamp at a very competitive price! Available in three sizes for 1-12 inch pipe fit-up. Durable acme thread design used for years in the field. Lightweight design is great for overhead work. With Stainless contact points standard, the PDQ is ready for exotic pipe fabrication out of the box. Great for most types of fit-ups. Pipe to pipe, pipe to elbow, pipe to flange amongst others. PDQ's fabricated design is the cost effective version of our KING clamps drop forged design. Part Number 1222 - PDQ 5-12 inch.